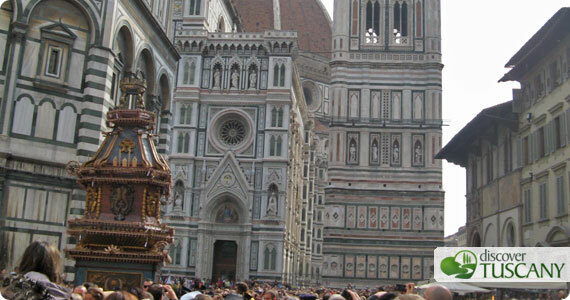 Just a few days to Easter and Easter celebrations throughout Tuscany start tomorrow, Holy Friday. According to Christian tradition, the Friday before Easter, called Holy Friday, commemorates the Passion and Crucifixion of Jesus Christ. For the occasion, many Tuscan cities organize processions and small religious celebrations. In Castiglion Fiorentino (Arezzo), tomorrow night (Friday), more than one hundred people will recreate the main scenes of the last days of Christ until his crucifixion. On the following day, a statue of Jesus will be rushed in a procession to the Collegiata Church for the midnight mass. In San Gimignano, Chianciano Terme, Seravezza, Grassina and Montespertoli – just to mention some of main events – the streets will be the backdrop to the religious processions and celebrations organized by the inhabitants. In Florence, in the Cathedral of Santa Maria del Fiore, on Friday at 5.30pm the Passion of Christ and Adoration of the Cross will be commemorated. On Saturday at 10.30pm there will be a vigil of the holy night for Easter. One of the most interesting events takes place in Florence every year on Easter Sunday: The Explosion of the Cart. Starting at 9 in Piazza Signoria, the parade in historical Florentine costume will accompany the “cart of fire”, a huge (three-stories tall), old wagon dragged by white oxen to Piazza Duomo. At 11am a dove-shaped rocket (symbolizing the Holy Spirit) starts from within the main altar of the Cathedral and flies out to light up the wagon, starting the the fireworks display. For this occasion, Piazza Duomo is usually packed with spectators, so if you want to assist the show, make sure to arrive well in advance. On Easter Sunday and Easter Monday both the Uffizi and the Accademia Gallery in Florence will be open, as well as the museum of Palazzo Vecchio, Palazzo Pitti (including the Boboli Gardens) and the Medici Chapels. The Brancacci Chapel instead is only open on Monday, April 25 from 1pm to 5pm. On Monday 25 starts the traditional Flower Exhibition held at the Giardino dell’ Orticoltura in Florence, with flowers and plants from major garden centers in and around Florence. Open until May 1. Also on Monday (and going on until May 20), the Iris Garden right below Piazzale Michelangelo opens up, a garden dedicated to the flower symbol of Florence; free admission – make sure to go, the garden is only open at this time of year to showcase the beautiful irises in bloom. All museums in Fiesole will also be open: you can visit the Museo Bandini as well the Archaeological Area and Museum.